New research has found that the number of Aussies intending to take a holiday has dropped since last year. 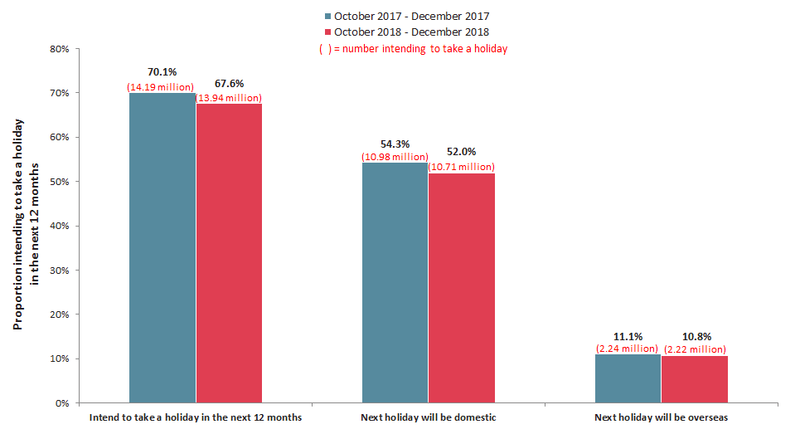 13.94 million Australians (67.6 per cent) said they intend to take a holiday in the next 12 months, a drop of 250,000 or 1.8 per cent from the same time 12 months ago. The decline in intentions was seen for both domestic and overseas destinations. The findings come from Roy Morgan’s latest Leading Indicator Travel Intention, which is based on a single source survey, involving in-depth face to face interviews with over 50,000 Australian consumers. Domestic holidays faced the biggest drop in intentions, down 270,000 or 2.5 per cent, compared to 20,000 or 0.9 per cent down for overseas holidays. The current position is that 52.0 per cent of Australians intend that their next holiday will be domestic (down from 54.3 per cent 12 months ago) and 10.8 per cent intend to take an overseas one (down from 11.1 per cent). It is worth noting that 1.01 million holiday intenders haven’t yet decided their likely holiday destination for the next 12 months. 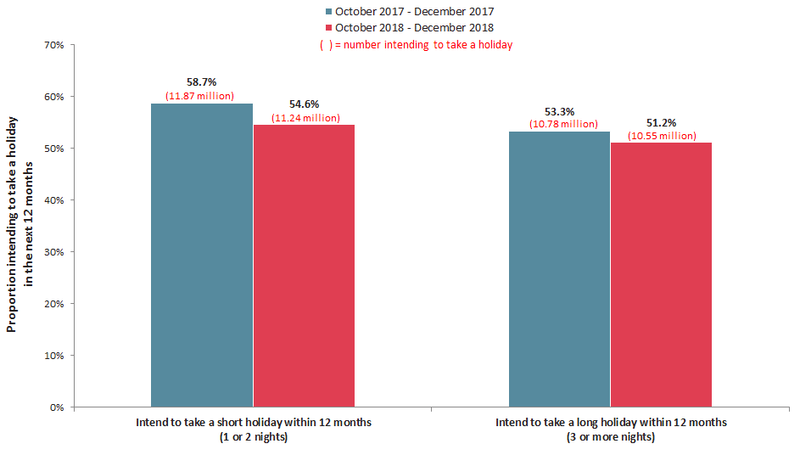 Short term holiday intentions (1 or 2 nights) for the next 12 months have declined to 54.6 per cent of the population, from 58.7 per cent a year ago, representing a drop of 630,000 or 5.3 per cent. Long holiday intentions (3 or more nights) have declined from 53.3 per cent to 51.2 per cent, a drop of 230,000 or 2.1 per cent over the last 12 months. Nearly three quarters of Millennials (72.6 per cent) or 3.54 million, intend to take a holiday in the next 12 months. 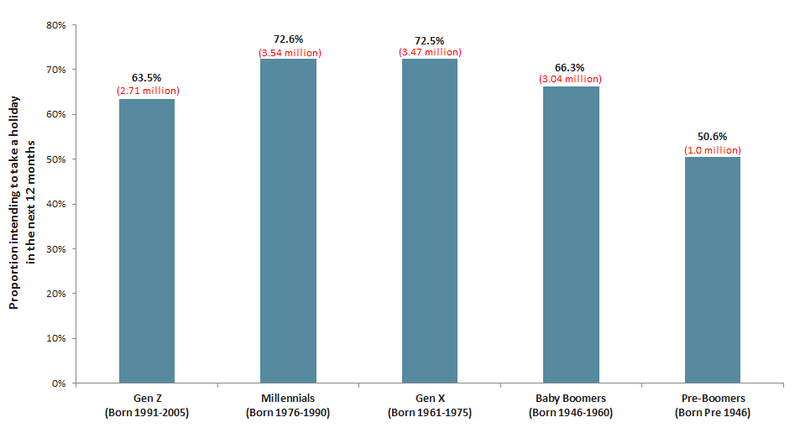 They are closely followed by Gen X with 72.5 per cent (3.47 million). Baby Boomers represent the third biggest market with 3.04 million holiday intenders (66.3 per cent) and Ge Z have 2.71 million (63.5 per cent). As would be expected, the least likely to be planning to take a holiday are the Pre-Boomers (aged 72 and over) with 50.6 per cent or one million. + many regulars who go to USA every December for 2 weeks are saying they’ll now only go every 2 years, but for longer, so airlines will miss out. Residents of Sydney were seen kicking cans down the road this morning and shaking their fists in a southerly direction after being ranked lower than their arch-rival city. Meanwhile, a snack counter full of chocolate chip cookies and a fresh supply of coffee just topped OUR charts for employee satisfaction. It beat its main rival by just one per cent! Which is, coincidentally, the same percentage of Travel Weekly staff members who are excited by Mondays.